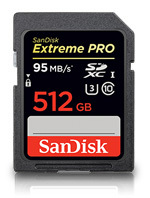 SanDisk announced at the IBC 2014 convention in Amsterdam that it is launching a new 512GB SanDisk Extreme PRO SDXC UHS-I memory card, which it touts as the world’s highest capacity SD card. It’s targeted to video pros shooting 4K Ultra High Definition (3840 x 2160p) video and Full HD video (1920 x 1080p) as well as photographers shooting in high-speed burst mode. SanDisk notes that the new card is exactly the same size as its original 512MB SD card, which was unveiled in 2003. The new Extreme Pro SD card features write speeds of up to 90 MB/s (megabytes per second), UHS Speed Class 3 (U3) recording speed to accommodate 4K video, and transfer speeds up to 95 MB/s. Not too shabby. Moreover, the new card is built and tested for rugged conditions: it’s temperature proof (-13°F to 185°F/-25°C to 85°C), water proof, shock proof and x-ray proof. It’s no surprise that this card doesn’t come cheap. The UHS-I card will be available soon for $799.99. B&H, for example, has it available for pre-order now with an expected ship date of October 15. The question is whether any shooter would want to store this amount of data on a single card. It’s a perennial question and generally, when photographers have the space they make use of every last kilobyte. However, some might be wary of packing so much material on a single card in case of failure. Massive storage also risks massive losses. The card comes with a RescuePRO Deluxe data recovery software download offer, if that helps.